The Willow on the River, by Woodland Stays! The Willow on the River, by Woodland Stays, features a first floor entrance to a tiled foyer. Walk up the open concept stairs to the loft style oasis. Open and airy awaits you on the second floor for your home away from home. Immaculate, large living room with vaulted ceilings, ceiling fan, bedroom outfitted with brand new Tuft & Needle king size mattress, #1 rated mattress in the world. Although this rental does not have a full kitchen, it does have a fridge/freezer, microwave, and coffee maker. Wake up and enjoy the water views from your bed. Or, walk through the double set of sliding glass doors onto your private balcony to enjoy the view and a cup of coffee. Although this rental does not have a full kitchen, it does have a fridge/freezer, microwave, and coffee maker. Large bathroom with double sinks, spacious stand up shower with a seat, two skylights and plenty of natural light. Towels are provided. Large walk-in closet for all your belongings. Iron and board are provided. The main home is attached to the apartment, however, both units are complete private. I am the owner of Furnished Solutions of New Hampshire. Beautiful bathroom furnished with double sinks, a stall shower, and skylights that let in lots of light. This property sits on the Merrimack river and has beautiful views year round. Small refrigerator/freezer located in the living room. This property was beautiful and looked exactly like it was depicted in the pictures online. Very clean and comfortable and the view off the deck was amazing. The only suggestions I have would be to add another towel bar or hook in the bathroom as there was only one. It was fine for me as I stayed there alone but if there were two or more people it would not be enough. And add a toothbrush and toothpaste to the “in case you forgot” basket. My luggage was lost by the airline so that would have come in handy. The property was very clean and comfortable. It is ideally located. The only downside is that traffic noise was loud at night. very comfortable, worth every penny. Better than any hotel you will stay at. Beautiful view!!! So beautiful, peaceful and comfortable! Property was exactly as described and very comfortable. Enjoyed my coffee each morning overlooking the beautiful Merrimack River. Easy drive to explore the Kangamangus highway and see the fall foliage! Enjoyed a delicious meal at Puritan Back Room which was close to the property. 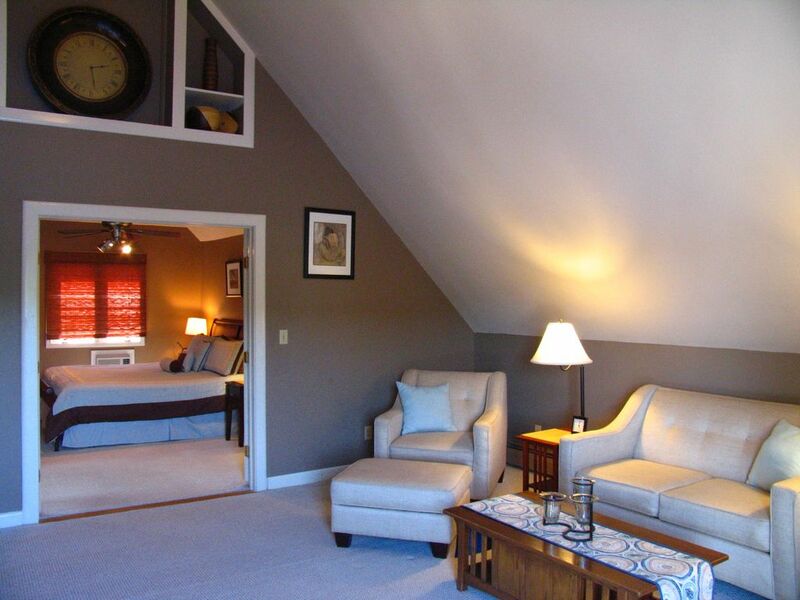 We almost didn't want to write a review because we'd love to keep this guest suite to ourselves! We stayed here for a long weekend to visit the area and to attend some events at the theater and arena. The location was perfect...just a 3 minute drive outside the populated area of downtown Manchester, NH. The suite was perfect, an entry-way greets you, with bench to remove our shoes, including a guest umbrella just in case you forgot yours! The suite was extremely clean, obviously well cared for...and as homeowners ourselves, we really appreciated that. Donna didn't forget anything that you might need...coffee, snacks, sweet treats, and water...it's all there while you take in the view of the river! Very tranquil view, with a cathedral ceiling living room full of natural light, providing volume and spaciousness. All of the rooms were large and nicely decorated and furnished, the bed was extremely comfortable, the bathroom provided everything that you could ever need or maybe forgot to bring with you. We can see why Donna has earned the "Super-Host" title. We would recommend that you stay here too...you will not be disappointed! Enjoy your stay! Stayed 1 night while passing through NH. The space is very clean, cozy, well appointed & thoughtfully arranged. Owner was very clear and timely with information. The only callout I would have is that the property is on a "busyish" street so if you are a light sleeper you might find this to be an issue as the bedroom faces the street. *This home is for the enjoyment of the registered guests only. 1. For liability reasons, guests may not bring any visitors or any others to my home at any time, for any length of time. Only those individuals who are registered guests, whose full names have been provided in advance and who have been paid for in advance, may enter the premises. No other individuals may be on my property. Strictly enforced with exterior security cameras. 2. No smoking, no pets, no parties, no drugs. 3. Shoes off at the front door. 4. Dishes should be cleaned and return to proper place. 5. The fridge should be left empty, except anything unopened. 6. Heat should be used to a maximum of 70 degrees. 7. No candles or space heaters, due to fire danger. 8. We can sometimes make arrangements for early check-ins and late checkouts however, this additional service will incur a $25 convenience fee. Arrangements must be made in advance. Same day requests for late check-outs cannot be accommodated, as the housekeeper arrives promptly at 11:00 am. 9. We are unable to host children under 10. 10. Do not download illegal materials from our Wi-Fi, it's very easy to trace who did it and you will be fined. Any violation of the house rules may result in the immediate termination of the booking agreement. In these instances, all fees will be forfeited and, where appropriate, deductions from the security deposit may be made.